The danger with stores opening up in areas popular with tourists is that they can be a little naff, overpriced and samey. Fortunately Cafetique is none of these things and is most definitely worth venturing into backpacker territory to check out. Being one of the only clothing boutiques on Jiu Gulou Dajie is certainly an advantage, and it doesn’t succumb to the touristy temptation of stocking nothing but hemp sandals and ethnic woven sacks. Yes, there are traditional silken clothes, and Yunnan-style embroidered goodies, but these are things that will appeal to residents as well as tourists. It’s also far from being outrageously overpriced (Nanluogu Xiang shopkeepers, take note), with embroidered shoes starting from RMB 80, silk jackets and dresses from RMB 300, and general clothing available from RMB 100. 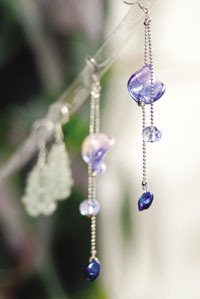 We loved the handmade earrings (RMB 15-100), and the other charming accessories. However, what makes the store stand out isn’t necessarily the goods it sells (although the earrings really are superb), but more the way it sells them. Intent on distancing themselves from any competition, Cafétique has plowed resources into ensuring that time spent in store is as pleasant and relaxing as possible. In order to create this experience, staff are chilled-out and friendly, and they’ve attached a bar. Shopping and drinking beer, a perfect combination! We like. Coffees start from RMB 12, soft drinks from RMB 10 and beers from RMB 12. A bar menu should also be available soon, and smoking is not permitted. It’s an unusual concept, but one that pleases us.